But is it dead? Well, nowadays it seems to have been placed back on that medieval shelf from where it once came, along with politeness and manners. While it is a matter of courtesy, in general, and not an issue solely between men and women, I’ve heard it said that chivalry reinforces the idea that women need to be helped or saved by a man. And, therefore, some men are more likely to not exhibit this behavior in order to not offend. What?? What a shame. Our lovely millennials are missing out on a wonderful tradition, is all I know. Call me old fashioned, but I love that after thirty-one years of marriage my husband still holds open doors for me, carries my bags, writes me notes, and brings me flowers. And I’ve never felt disempowered by it, or any less independent. Same when a man lets me in and out of the elevator first or holds open a door. I don’t need or expect them to do it, but I do like and appreciate when it happens. The noticeable decline in good manners, politeness, and chivalry didn’t just happen, though. It’s been inching along for quite some time. A fruit of society’s “sálvese quien pueda” (every man for himself) mentality, I think. And I don’t know, I won’t elaborate, but could it be also that it’s harder to practice this behavior while living between 140 character tweets? Hmm…. 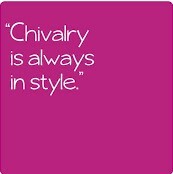 Moms and dads, teach your sons to be chivalrous and your daughters to embrace it. I must say I feel hopeful when I see my son (thankfully) employ the same chivalrous practices as his father. So, is it dead? I say no, but it could sure use some taking down from the shelf and dusting off. For chivalry, today and always, I am thankful. Until next Thursday’s post…si Dios quiere. Hear, Hear!! I feel happy when a stranger holds the door for me, so I always, ALWAYS glance back to do the same for someone else. I love when my husband places his hand on my back, as we walk to be seated somewhere, assuring me he’s there. He holds my hand, seeking it out, when we walk side-by-side. I think to myself, “Never take that for granted, because you’ll miss it.” Civility allows us to know how to be civil in society. Basic do’s and don’ts, if you will. I’ve read George Washington created many in a how-to book. I’ve never confirmed it though. Thank you, President. Please buy the book in support of St. Jude Children’s Research Hospital and Autism Speaks. Click on images below. Share book reviews and ratings with Connie, and even join a book club on Goodreads. Visit Connie's profile on Pinterest.